Much too often since the election of Donald Trump, I have felt a sickening sense of return to the 1950s. January 31, 2017, was one of the bad days. I watched the Senate Committee on Health, Education, etc., review the nomination of Betsy DeVos as Secretary of Education, hoping without much hope that the senators would reject such an obviously and utterly unsuitable candidate. It all went as I feared: DeVos made her way through the Committee despite the opposition of every Democrat and the reservations of two Republicans – Senators Susan Collins and Lisa Murkowski – both of whom, despite their “concerns,” voted to send the nominee forward. She was approved by the full Senate and is now our Secretary of Education. The Committee’s proceedings and outcome were depressing enough, but it was Senator Tim Kaine’s remarks, specifically, that dragged me back to the 1950s. During her initial hearing, DeVos had revealed her ignorance of the Individuals with Disabilities Education Act of 1975 (IDEA), a federal law requiring public schools to provide free and appropriate education for students with disabilities. (Irony alert: just a few weeks after the DeVos hearing, the Supreme Court unanimously ruled to upgrade the provisions of IDEA, reversing a lower court ruling by none other than Neil Gorsuch.) Apparently unaware of the very existence of IDEA as well as much, much more, the nominee had asserted that the needs of students with disabilities should be left to the states. Senator Kaine, referring to that ignorant assertion, reminded his colleagues that as a Virginian, he knew what could happen – and had happened – when educational justice was left to the states. Kaine’s words, spoken almost as an aside, evoked some dismal memories. Most Americans know that the May 1954 Supreme Court decision in Brown v. Board of Education of Topeka ended de jure segregation in public schools. However, much of what happened in the following years may have been forgotten except by old-timers, American historians, and Virginians such as Senator Kaine. The Court’s announcement of the Brown decision was what we might today call Real News; it had been a long time coming. From many parts of the country, including my perch in college in New England, cheers went up from those who recognized the abysmal failures of “separate but equal” as established by Plessy v. Ferguson, the infamous 1896 case that legalized racial segregation. There were loud cheers for the Warren Court, and for the NAACP lawyers who had been working on school desegregation for two decades before they argued Brown (see Kenneth Mack, Representing the Race: The Creation of the Civil Rights Lawyer, 2012). We welcomed the decision as a necessary, overdue step forward for education and for democracy. Negative reactions were just as loud and just as heartfelt, especially and predictably in parts of the country where racial segregation in schools was established by law. One year after Brown, as southern states requested exemptions, the Court issued a second, enforcement decree (aka Brown II), upholding the earlier decision but leaving its implementation to local school boards and declaring that desegregation must be advanced “with all deliberate speed.” Brown II was at best ambiguous: what is deliberate speed, exactly? In parts of the South it was interpreted as sometime – maybe never. 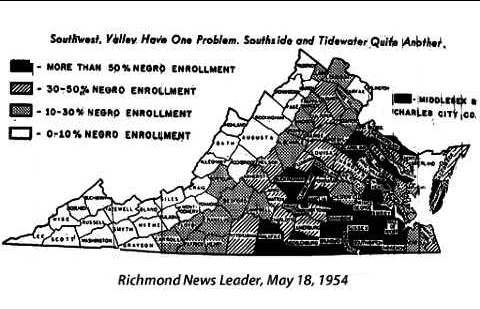 Opposition to integration in Virginia grew ever more determined and vociferous, increasingly so after the crisis in Little Rock in 1957. Virginians, along with the rest of the world, witnessed what some of them regarded as the nightmare of federal troops enforcing integration at Central High. In 1958, public schools were actually closed in many parts of Virginia, and the first wave of students fell victim to what had become a kind of holy war for states’ rights, local option, and “choice.” Alternatives to public education were hastily assembled for white children; nothing was done for black children. If Brown was complicated, Brown II, in hindsight, was disastrously vague, leaving more than enough room for decades of struggle over the timing and terms of desegregation. Some critics of Brown argue that the Court overlooked or chose not to recognize the depth and persistence of racism that continues to shape our educational system regardless of law, and not only in the South. Veterans of the 1970s in Boston remember the busing struggle all too well, along with associated scenes that could have been witnessed in Virginia in the 1950s. The battle for educational justice was certainly not settled by Brown or Brown II – far from it. But no matter what our conclusions about the decisions and their consequences, we cannot ignore the lesson mentioned by Senator Kaine. As he remarked, we know what can happen when educational justice is turned over to the states – as was suggested, in ignorance and indifference, by our new Secretary of Education. Thank you so much for this! I always learn so much from your posts and the clarity with which you write. My family — both sides — are from Appomattox, which is about 20 minutes from Farmville, but I knew almost nothing of this history at the time. I learned as an adult that a relative taught in the “improvised and impoverished” schools for black children that you described. Very important article. We need to remember this history! And Atkinson consistently does such a great job of just this. I feel as if someone is doing the hard work for me–research, organization, getting to the heart of the matter. And so I find these posts invaluable, especially now. I was living in Richmond VA during all of that “massive resistance”. As I recall, the first “charter schools” that grew out of that movement were started in churches – giving them the cloak of religious immunity from criticism. Any school that was called “Christian” was clearly a whites-only environment. Thank you so much for such a beautifully comprehensive and pointed narrative of Virginia’s response to Brown and its historical signification. DeVos’s suggestion that fairness in public education “should be left to the states” is another example of how to “Make America Great Again.” Everybody knows what it means, for it means what it has always meant: that enabled, white, wealthy, powerful people (like DeVos) will make the policy that shapes public institutions to their own advantage, and everybody else will have to do with much less. Prince Edward from your book! Excellent description of the Virginia response to Brown. “Liberty” (or “choice:) to reactionaries means only one thing: preservation of the current power structure and economic regime. As for De Vos, she is simply another Trump appointee presiding over a department up for destruction. This is not so much a government as a group of monkeys throwing wrenches in the gears of agencies. And all of them, though destined for the ridicule of history, will get lucrative post-administrative positions for their efforts. What you so cogently describe is, selfishly, what led us to schools in an affluent Northern community. Our children were not to be hostages to fortune. Is this a clannishness that will split the nation? Has the country been split since its founding and held together by smoke no longer dense enough to hide the fractures? As always, you have added an historical perspective to a troubling current reality. Oh you, historian.